Bhitarkanika National Park (BKNP) is famous for the saltwater crocodiles, an endangered species. 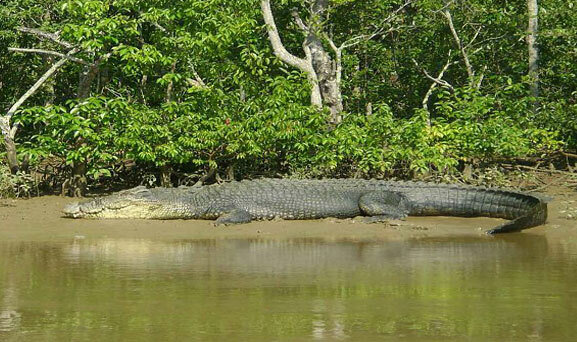 More than 700 saltwater crocodiles inhabit the water bodies of Bhitarkanika. 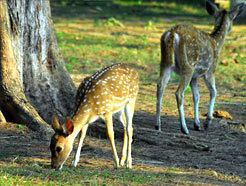 The national park is 672 sq km of forest land, situated in the estuarial region of Bahmani and Baitarani. The name Bhitarkanika originated from name of Kanika kings, who ruled this place. It is in Kendrapara district. You will find mangrove forests in the region. The region is a delta surrounded by the rivers Bramhani and Baitarani as well as sea. The area is criss-crossed by numerous creeks, tidal rivers and rivulets. Wild animals like the saltwater crocodile, leopard cat, fishing cat, jungle cat, hyena, wild boar, spotted deer, sambar, porcupine, dolphin, saltwater crocodile, sankhua crocodile, python, king cobra, water monitor lizard, terrapin, marine turtle, kingfisher, woodpecker, hornbill, bar headed geese, brahminy duck, pintail, white bellied sea eagle, tern, sea gull, wader and large variety of resident and migratory birds. To visit the Bhitarkanika National Park take the route via Bhadrakh (Railway) or Bhubneshwar (Air) and park Authorities may be contacted in advance for accommodation in the rest houses. You can reach Bhitarakanika from chandbali there is a daily bus which reaches the distance in 14 hours. A ferry connects Natitapatia to chandbali (1.5 hours). From Natitajahu to Dengmal the distance is 6 km. this the place from where boats can be hired. Jungle trek: You can follow the fascinating jungle trek a 3.5 km long trek in Bhitarkanika forest to visit the ruins of an ancient village of old mariners. Climate: The climate in Bhitarkanika is moderate. The monsoons make the rivers turbulent and are safe only during morning. You should also take note of weather forecast reports and the warning signals given at the Paradip and Chandbali ports.